Burning things and playing in a track hoe. Sounds like a fun day to me! Know how hard it is to scoop one of those big boulders up? .. thinking some kind of mining classifier maybe. Been helping the neighbor with a kitchen remodel project. Built this cabinet today to put above the fridge. It’s one of those double fridge/freezer commercial lookin things. 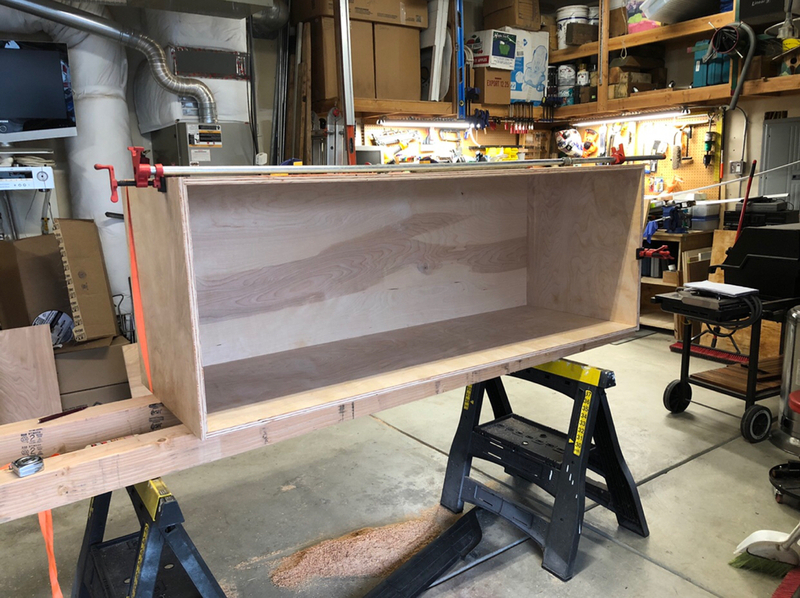 Planning to put 4x4s underneath the cabinet to each side wall and then build the face frame in-place to finish it off. Wife and I ran some races this weekend... 22.4miles total over the three races. I got 7.5lbs of pulled chicken from those 4 birds. As of this point I My life I officially hate white cabinets. They are terrible to make look great. Took a day of vacation finally. Ran errands and now relaxing. Bought a trailer, working on the Gator, looking for a tractor. Has anyone here used amazon pay? $$ is via amazon gift cards, put onto an invoice and you do the exchange. I have used amazon pay.... to purchase from a store. It’s a scam, almost certain of it. You would provide the amazon pay cards and there’s no tracking it past that point. You couldn’t challenge it with your credit card company or bank. Tell him cash only, if he insists on something else it’s a scam. I’ve dealt with something similar in trying to buy a kubota tractor few years back. Yep, clicked on chat and it all seemed great, to great. Then I went through my account on amazon, contacted support and they got my on the phone with AP. Straight up scam, even walked me though the amounts and escrow part (they don't do that). So much for the Gator, but my $2500 is still mine. Yea, some years ago, I was trying to purchase a mini excavator, J Deere 50 or maybe a 60 and it turned out to be a scam. Special place in hell for thieves. Sorry to hear it, but glad you didn’t loose any money. The scammers are consistent in their methods and eventually get one to pay up front. I texted back in forth with one until he finally admitted it, then he offered me a job NO THANKS! Learned a lot that day. Yeah, I was excited! But when it came to pay it just didn't feel right. Now just another lesson. I have to qual in the morning, hope I pass. I didn't go trucking yesterday because of the weather. I finished up a bunch of of odds and ends on the camper and truck. I don't know what I'm going to do today yet. Glad none of the important things were injured Tex. So happy you and family are OK! Glad everyone is OK TRN, to bad about the wifes van. Smart tornado, picks on a van. Hear they sound like a train outside you window. CCW is federal, good in 50 states as long as I qual somehow. Looked at several more tractors. Glad you dodged the twister. Seeing the news this morning it was really bad. Stay safe! Glad you are all safe. I have not had the TV on yet today. First I heard about it. Prom was last night so I photo bombed one my daughters pictures. Then we went out to eat with some friends we haven't seen in a long time. That picture should be stuck to the dash of her date’s vehicle. Just as a reminder. True, but there is something strapped to his right hip. Even if it’s just a pair of pliers, they could be weaponized. I’m sure Jon could find a creative way to explain that process to the young lad. Right on all accounts. My dad told me how he use to be able to kill rabbits from the tractor seat by throwing his pliers like a ninja star. Dang, I should have told the kid that story. Save it for next time. He seems like a good kid and he has a job. Glad you’re okay and only sustained minimal impact personally.